The Polyphaetis is a fly that predated the now widely used jig hooks but shares many of the same advantages namely it fishes hook point up and avoids excessive snagging on the bottom. 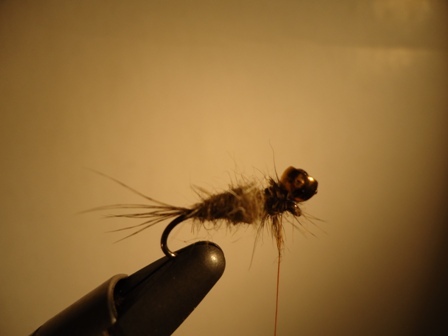 I popularised the fly on the competition scene over a decade ago. This is the updated version of this great catching fly. It remains a super fly and is ideal for use in conjunction with modern styles such as French and Czech nymphing. What does it represent? Everything and anything but generally many of the cased and free living caddis species found living in streams. 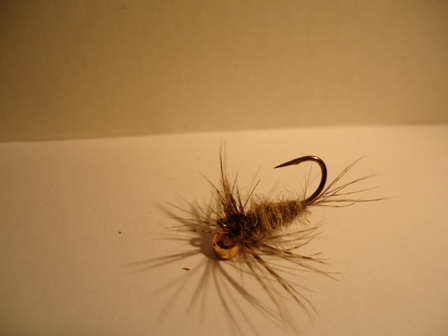 The incorporation of soft hackles gives a superb impression of life. 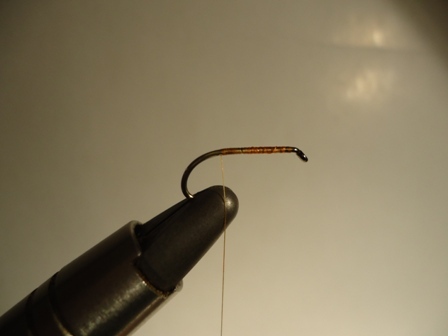 The aspect of the hackles is different from hackles wound around a hook shank and maximises movement. 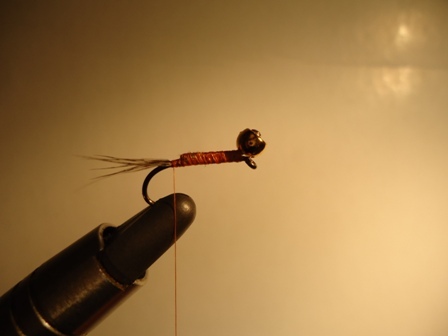 The Tungsten bead mounted on a dress pin and whipped to the hook inverts the fly giving it a unique aspect when fished. Unlike a Jig hook the full gape of the hook is maintained. Materials: thread, Kamasan B175 hook, soft steel dress pin with a flat head, a tungsten bead (available here), 07 Olive or 02 Natural Dark UV Hare's ear plus dubbing for body (available here), 05 Red Brown UV Hare's ear plus dubbing for thorax (available here), a partridge neck feather, a CdC feather (available here). Mount a Kamasan B175 hook in the vice after removing the barb and catch in the thread. Select a soft steel dress pin with a flat head and bend it below the head as illustrated above. Add a tungsten bead to the pin as shown. 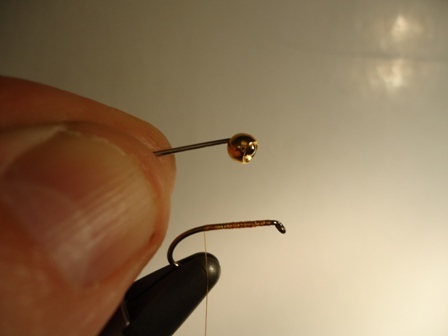 This one is a 4mm gold one (for hook size 10) or 3mm bead for hook size 12 and 14. Black and silver tungsten beads are also good options. 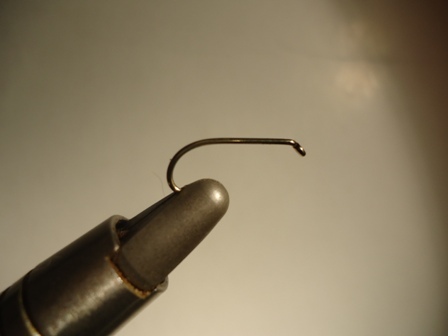 Cut the pin so that it covers about three quarters of the length of the hook shank and bind in very tight with multiple turns of thread. 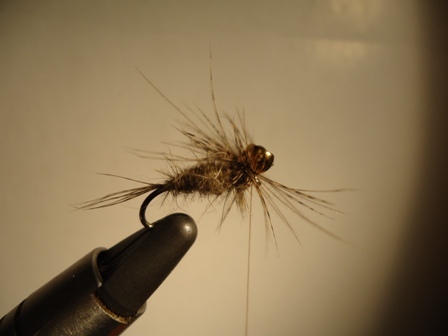 Add a few fibres from a partridge neck feather as a tail. Dub in the body material which in this case is 07 Olive UV hare's ear Plus. Darker 05 Red Brown UV hare's ear Plus spike fibres are used for the thorax section of the fly. 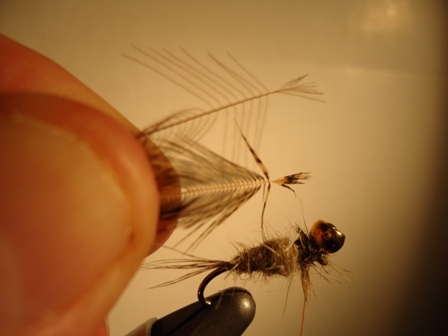 Select a CDC and a partridge neck feather and prepare the tips as shown above. Catch in the tips of the feathers around the shank of the pin with the thread thus. 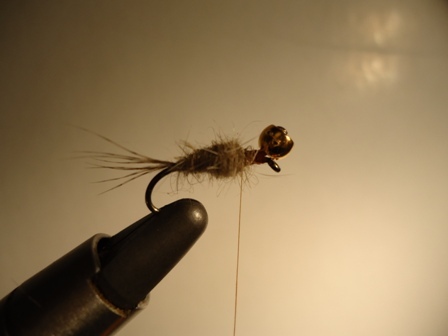 Add 2-3 turns of both feathers around the shank of the pin- not the hook! 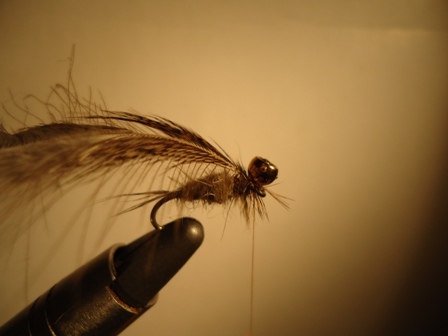 Tie off the feathers with the thread and trim the unused excess and the fly nears completion. 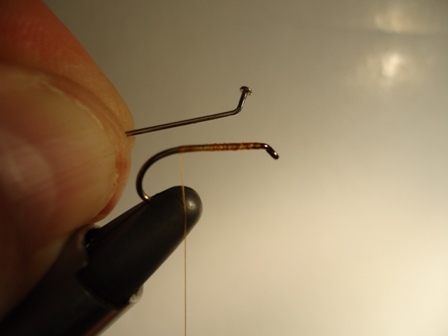 Whip finish around the shank of the pin below the tungsten bead, cut the thread and your Polyhaetis is ready to use! 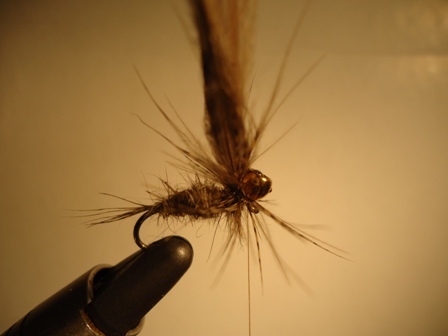 To buy the materials for the fly please click here. 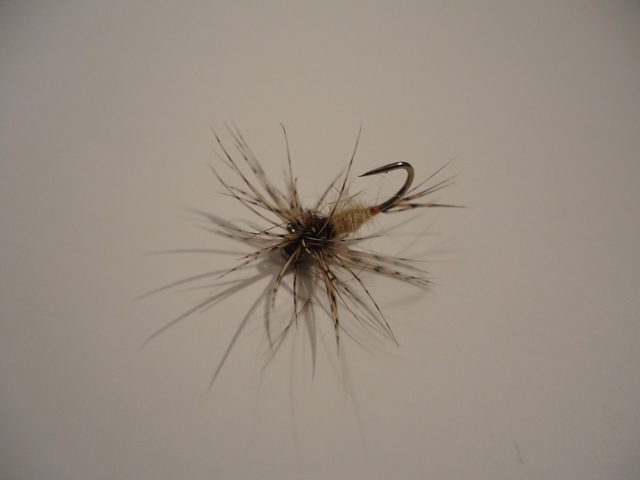 To purchase the Polyphaetis Nymph please go to our Ostream-guide Products page.